In late summer 2013, Entergy announced that the Vermont Yankee Nuclear Power Station (VY) in Vernon, VT would no longer operate as a nuclear energy production facility. On December 31, 2014, VY ceased its energy generation operations and began the long term process of decommissioning and then dismantling the facility. This event created significant immediate and long-term impacts on the regional economy due to the number of employees laid off, the substantial loss of earned income, the loss of contracts for local subcontractors and suppliers, the loss of spending in the region, and other factors. Upon the announcement of VY’s closure, a new collaboration emerged of regional planning and economic development organizations serving the tri-state region: FRCOG, Brattleboro Development Credit Corporation (BDCC), Southwest Region Planning Commission (SWRPC), and Windham Regional Commission. These partnering organizations recognize the challenges ahead, and that it is happening at a time when the area is working diligently to recover from the recent economic recession and the impacts of 2011’s Tropical Storm Irene. Businesses, workers and consumers continually traverse community and state boundaries. This effort recognizes this regional economy, and seeks to leverage the region’s shared assets for greater economic opportunity. Recently, BDCC was awarded a U.S. Economic Development Administration (EDA) to support the Green Building Cluster and develop a business accelerator program. A portion of this grant was also set aside to support collaboration building for this new planning initiative. Partnering organizations, including the FRCOG, will receive sub-awards to: (a) identify and engage a broad range of stakeholder groups; (b) conduct an analysis of each area’s CEDS Plan to determine shared strengths, challenges and opportunities; (c) and draft a white paper on the lessons learned so far about addressing economic impacts due to nuclear plant decommissioning. The partners see this work as necessary to build the foundation for a larger effort that will seek state and federal assistance to support business growth, increase employment opportunities, and create a more robust and dynamic economy for the Tri-State Region. For more information, please contact Jessica Atwood, Economic Development Program Manager, at 413-774-3167 or jatwood@frcog.org. Disaster preparedness includes every member of the family. Don’t forget the pets!! The US experienced 10 distinct billion-dollar disasters in 2015! What will 2016 bring? Checklists can help us prepare for disasters and make sure nothing gets forgotten. Here is a general Winter Weather Checklist from the CDC. Make sure to add items that meet your and your family’s specific needs. A power outage is probably the most likely emergency event in any given winter. Be prepared! Utility damage from October 2011 snowstorm. Photo credit: Paul Franz, Greenfield Recorder. The Turners Falls Tree Inventory was completed in fall of 2015 and provides the Town of Montague with a GIS (geographic information system) data layer with each tree’s location, genus, species, common name, height, canopy spread, condition and other vital information. This data layer, along with printed maps, infographic poster, and report, will be used by the Town of Montague’s Planning and Conservation Department and DPW to manage, maintain, and plan for additional plantings of trees in Turners Falls. Download the infographic poster and final report. For more information, contact Mary Praus at mpraus@frcog.org. The Whately Food Assessment was completed in December 2015 and helps the Whately Agricultural Commission make the case for protecting one of Whately’s greatest assets – it’s excellent farmland. 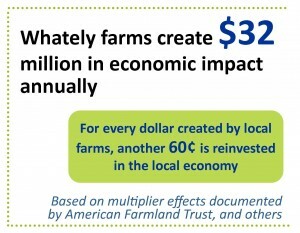 The report, presented as a series of infographics, is available at the Whately Town Hall, Library and in the Whately newsletter, and illustrates the economic impact of Whately’s farms to the community. It also addresses the cost of community services and the status of preserved land in Whately to date. The report also provides strategies for protecting more farmland, especially important as the housing market begins to pick up, putting some of Whately’s agricultural land at risk for development. The complete report is AVAILABLE HERE. For more info, contact Mary Praus at mpraus@frcog.org or 413 774 3167 x131.